Welcome to the Members’ Only section of the AHWA. When you log in, you will find yourself on this page. On the right hand side are links allowing you to view and edit your Member Profile and to create or edit your Member Page. Your Member Page will be visible to members and non-members, so use it to promote yourself and keep it updated. Member News – important announcements for members, competitions, giveaways, and more. AHWA publications – FREE downloads – This is a membership privilege, please don’t share publicly as we want to encourage new members to allow us to provide more member services. Member Benefits – details on what opportunities are available to you through your AHWA Membership, and how to access those benefits. Critique Groups (Email: crits@australianhorror.com) – work with other writers in groups of ~10 to develop your short stories. The groups operate online so you can take part no matter where you live. Mentor Program – this will run annually, and will provide opportunities to work one-on-one with some of the best writers across Australia in order to improve your writing and story telling. Watch for announcements on the news page! 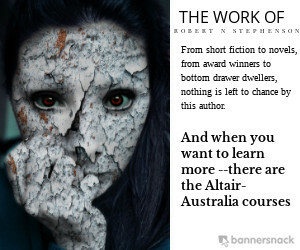 Sinister Reads (Email: books@australianhorror.com) – When your short story, novel, collection, anthology, poetry, or non-fiction work has been published, let the team at Sinister Reads know so we can promote it. Forum Although still usable, this is primarily kept as an archive of informal chat sessions between AHWA members. Feel free to use it get to know your fellow AHWA Members or go to the AHWA members-only FaceBook group instead. We always welcome your feedback, so if you have any ideas for projects or articles, suggestions for website content or comments on what’s already there, please let us know on ahwa@australianhorror.com, or alternatively, by posting a message on the FaceBook group if you would like all other Members to be able to comment. The AHWA is your organization after all, and it will only continue to grow with your support.